Whether a family-friendly jaunt or a day out with your other half, a day in Sungei Buloh is the best way to explore Singapore’s first ASEAN Heritage Park. As a city in the tropics, Singapore’s warm climate brings with it local and migratory wildlife – from egrets and herons feeding in the marshes to scarlet-backed flowerpeckers concealed amongst trees. It’s reason why the 202-hectare Sungei Buloh Wetland Reserve attracts birdwatchers and nature photography enthusiasts, but you needn’t be either to appreciate nature at its most untouched. If you’re lucky, you’ll spot muscular monitor lizards ambling across paths or otters skimming the banks of the wetlands. Occasionally, saltwater crocodiles do make an appearance, most often near mangroves where warning signs have been posted. Should you encounter one, back away calmly and call +65 6794 1401 (from 8.30am – 5.30pm) or 1800-4717-300 (after hours). Besides these reptiles, Sungei Buloh teems with crabs and mudskippers; you need only observe the marshes with a keen eye to spot them. 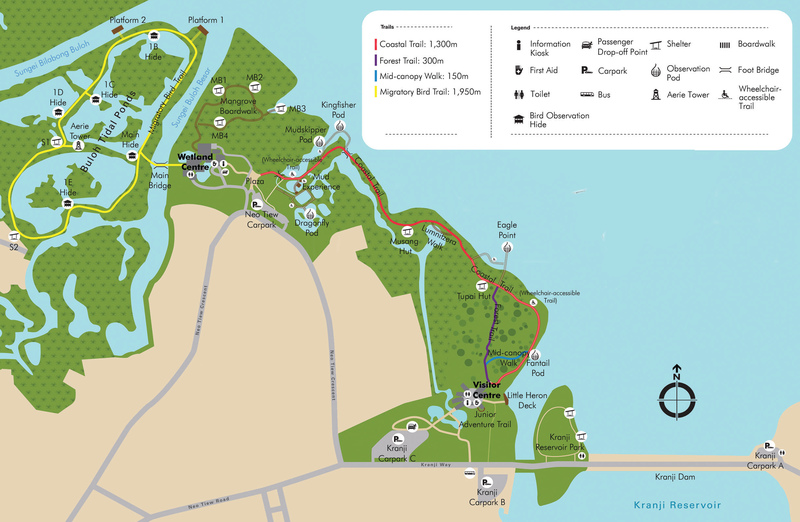 Sungei Buloh Wetland Reserve can be easily covered within two to four hours, depending on which of the four trails you embark on. The ecological site is a web of boardwalks, bird observation huts, foot bridges and well-paved gravel paths, with clear signage at regular intervals. Starting from the Wetland Centre, embark on the Migratory Bird Trail (1.9km) – the longest trail that wraps the Buloh Tidal Ponds. For a bird’s eye view of the area and glimpses of Johor Bahru, Malaysia, a quick hike up the Aerie Tower is necessary. Equally picturesque is the Coastal Trail (1.3km) that’ll take you past several manmade pods, including the Kingfisher Pod and Eagle Point. The Coastal Trail intersects to meet the Forest Trail, a quick 300-metre stroll of yet more greenery that then takes you to the Mid-canopy Walk (150 metres). If you’ve little ones in tow, work off their energy at the Junior Adventure Trail, the final stop before you land at the Visitor Centre. Wheelchair-friendly paths are available for certain trails, too; familiarize yourself with this map before you embark on your walk. Sungei Buloh is best enjoyed during sunrise, up till before the afternoon sun hits, or from 7am through 11.30am. While Singapore enjoys warm weather all year ’round, always have an umbrella or rain poncho handy – and wear comfortable walking shoes, breathable clothing and a hat. Sunblock, insect repellant and plenty of water are essential, and a pair of binoculars will help you spot interesting species of birds from a distance. Should you be caught out in a heavy downpour, make for the closest observation hut or shelter, of which you’ll find plenty during your walk. The area only has two restrooms in the Wetland Centre and Visitor Centre, respectively, so be sure to make a stop before going off on your exploration of one of Singapore’s best nature reserves. These essential tips before travelling to Singapore should keep you in the know.